Almost every order placed by 1pm eastern is shipped out the same day. 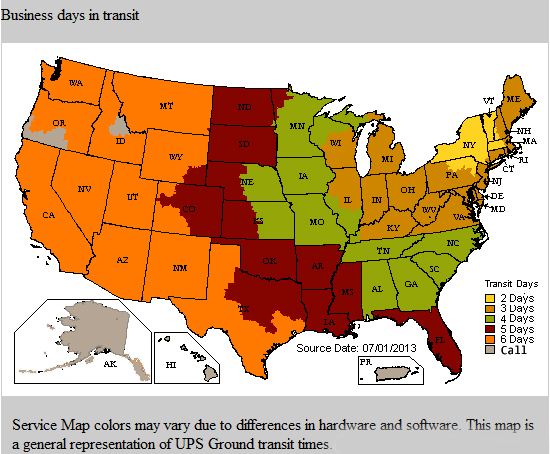 Transit times vary depending on the delivery location (see the map below). For faster shipping we are happy to offer UPS air services. Pricing is calculated based on the delivery address and contents of your order. Illinois, Indiana Michigan, Ohio, Pa, Virgina 3 to 4 business days. Whenever possible we will ship to any location within the continental U.S. and Canada. In the event that a ship to location Causes higher than usual freight costs we will contact the customer with further information and options. We will always do our best to provide the most effective shipping price and service. We will never ship an order and charge an additional fee for shipping without the customers authorization. All shipments within the U.S. are not subject to municipal, state or federal tax. Additionally if an order is shipped from our Canadian fulfillment center we will handle any additional expense or logistics to get your product through U.S. customs and to you quickly. Note that while we do not charge any US taxes you should always consult your local tax office to determine your local requirements. The information provided on this page was updated on April 28th, 2017. From time to time prices and policies may change without notice. It is always suggested to read online policies when using any website, if anything is unclear feel free to contact us for more information.